Enga Regional candidate for the Triumph Heritage Empowerment (THE) party, Sandy Talita nominated on Monday afternoon in Wabag. Despite the short notice, it was an overwhelming show of support by the crowd that witnessed the nomination. The candidate and THE Party leader, Don Polye, who was there to witness the occasion were paraded around the town by supporters. 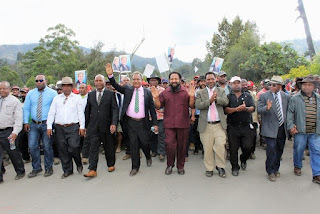 Polye announced that he wants one commitment from the people of Enga to assist him fight corruption and salvage the sinking economy after the election. He called on them to vote out the incumbent Governor Sir Peter Ipatas. Polye said he regretted Ipatas’ behaviours which did not reflect his calibre as a senior statesman. He said Ipatas should have joined Sir Mekere Morauta, Sir Julius Chan, Sir Michael Somare and Sir Rabbie Namaliu’s chorus on championing upright leadership and speaking against corruption and ill-decisions by the Prime Minister Peter O’Neill.